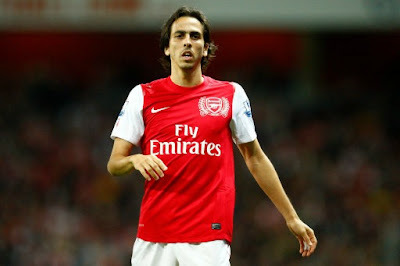 Ashburton Grove - Arsenal news and Arsenal opinion: No medical, last minute but could Yossi Benayoun be a surprise package? No medical, last minute but could Yossi Benayoun be a surprise package? On New to The Arsenal we'll look at the signings Arsene Wenger made during the Summer transfer window and look at each individual player's performance and analyse their input into the game. Today Joss Bennett looks at Yossi Benayoun's performances since joining on a season long loan from Chelsea. Perhaps the only relatively “risk-free” Arsenal signing this summer, Yossi Benayoun has barely had any expectations to live up to after a successful spell at Liverpool, and a slightly less successful one at Chelsea. Whether the Israeli captain does well or not, his future still appears unclear – will Chelsea take him back? Will Arsenal sign him on a permanent basis? Or will he move on somewhere else? Regardless, Benayoun will be looking to do all he can to impress potential suitors. In such, this short-term move could be perfect for both Benayoun and Arsenal. The Israeli midfielder has already shown his determination to work hard for the club – in his best performance for the club (the 1-1 draw with Dortmund), Benayoun made three tackles and four interceptions, as well as making one crucial shot-block*. Despite Benayoun’s bit-part role (he’s made only four appearances in the Premier League – all from the bench) doesn’t seem to have fazed the 31-year-old either. Benayoun has taken full advantage of the chances he has had; with a goal and two assists in just two Carling Cup appearances**. Aside from his impressive statistics, Benayoun has brought an important versatility to this Arsenal side. As is well-recorded, Wenger has always used the Carling Cup to experiment with young players and new tactics – this season has been no different, and Benayoun has fitted right into the different systems. Against Shrewsbury, for example, the Israeli was given less freedom than he’s usually used to – with the full-backs allowed to bomb up the pitch, Benayoun and Alex Oxlade-Chamberlain were given more defensive responsibility. However when Arsenal had the ball, the two wide-forwards were pushed up to make a front four, from where Benayoun got his goal. Again, against Bolton, Wenger made some tactical tweaks – the team was essentially split into halves; defensive and offensive, with neither half particularly contributing to the other phase. Benayoun did well in a very free, and attacking role; constantly swapping with Andrey Arshavin in the middle, and Oxalde-Chamberlain on the right wing and linking up well with lone striker Park Chu-Young. Despite hardly playing, Benayoun’s impressive performances when he has played have been encouraging. If we go back to his superb display against Dortmund in the Champions League, his statistics show us how useful he could be – even if only as a 65th minute substitute away to Stoke. His three successful dribbles, two key passes and two turnovers gave us something different against the well-disciplined German champions. If Benayoun can get more regular game-time, and time to gel with the rest of the team, he may well give the Arsenal boss a selection dilemma next summer. Does Wenger keep Benayoun and move on one (or both) of Rosicky or Arshavin? Or to extend his current players’ contracts and send Benayoun back to West London?